The timing of our visit to Madi-Madi has not been good. Two years of drought have reduced the beautiful waters of the Kammanassie River to the occasional water hole. The lawns around the lodge are irrigated and manicured, a verdant green tantalising us with the promise of how lovely the countryside will be when the rains return. For now however we must be content with the parched and sun-baked landscape. 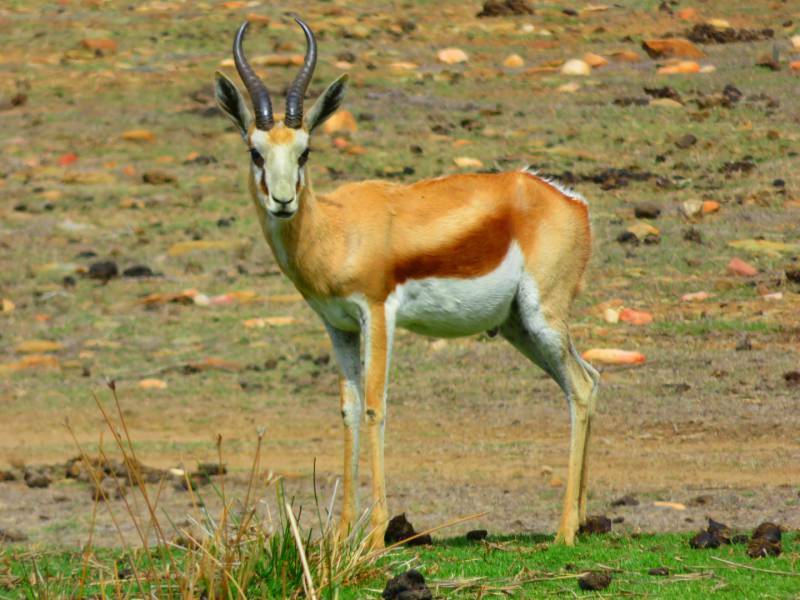 It is easy to see why the springbok was chosen as South Africa's national animal. A herd of springbok visits the river bed in front of our terrace each afternoon. Although the lack of rain has taken its toll on the local wildlife, there are still enough large animals to make the afternoon game drive an adventure to look forward to. In the mid-afternoon we are met by our guide, Cherise, and a young couple from Germany with their six year old daughter. The little girl wants to see giraffes and Cherise is confident she knows where the herd is. After fifteen minutes or so bumping along in the open sided land cruiser the giraffes come into view - a family of seven parading toward us along the dry river bed, pausing occasionally to reach up for high leaves on the acacia trees. They seem quite picky, munching away at one or two plants for a while before abandoning them for new trees further away. Cherise explains that the acacias have a defence mechanism to dissuade giraffes and other herbivores from decimating a single tree. After being grazed on for a while the leaves begin to produce a bitter tasting tannin and the giraffes move on. The acacias even 'warn' other nearby trees to step up their own production of tannins by emitting ethylene into the surrounding air. 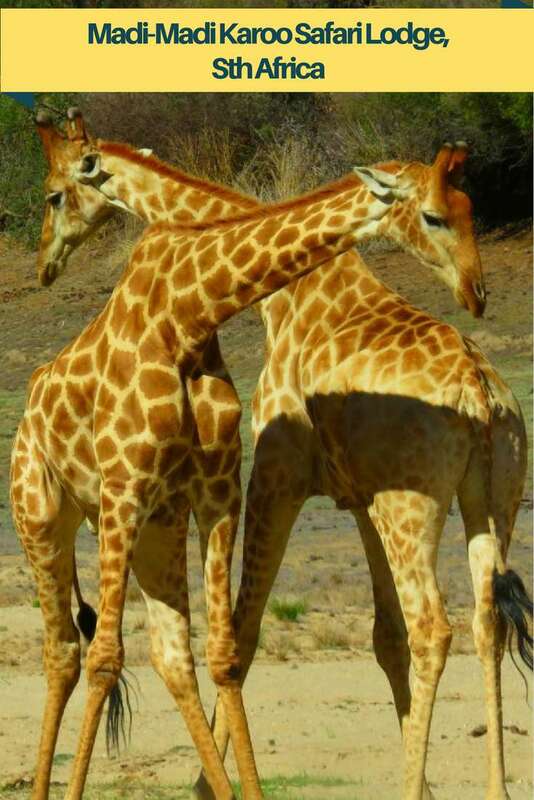 These young giraffes were practising their fighting skills - or maybe just showing off for the tourists! The herd feeding on Acacia trees. After a while we pull ourselves away and continue our drive catching sight of a small group of zebra, a troupe of baboons and several more of Madi-Madi's resident antelope species. This zebra was tail-end Charlie in the herd. He stuck around just long enough for me to snap a quick photo. Is it just me, or does he look like he is posing for the camera? 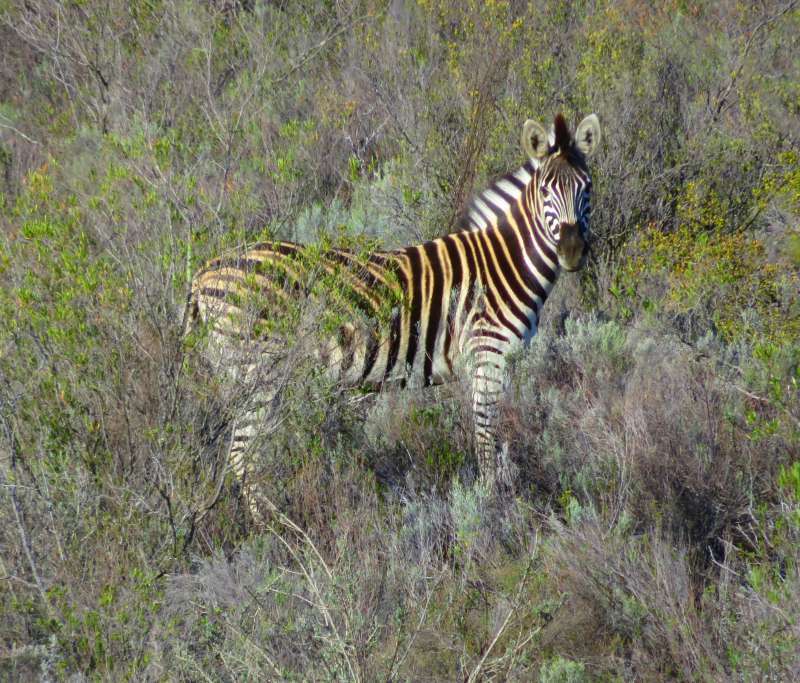 On our second day we forego the game drive and join a guided bush walk instead, hoping to see some of the smaller inhabitants of the Klein Karoo. We look for centipedes, scorpions, plants and other insects with varying degrees of success and learn how the species interact with each other to create a rich biodiversity of flora and fauna. Heading back to the lodge we are rewarded with a passing herd of springbok putting on a great show of leaping. Our bush walk took us beyond the manicured lawns of the lodge. Much more than a game reserve, Madi-Madi is a place to come to relax and unwind. Time passes slowly, with lazy mornings and long languid afternoons punctuated by the occasional bush walk, game drive or horse back safari. A family of partly tame meerkats lives near the lodge and provides us with entertainment watching their busy, energetic little lives. They bounce from play-fight tussling, to furious digging, to striking statute-like poses on high alert before going back to gambolling about with no apparent rhyme nor reason. They hang around under the table at meal times and we can almost see their thought processes as they try to work out the best strategy for persuading us to feed them. 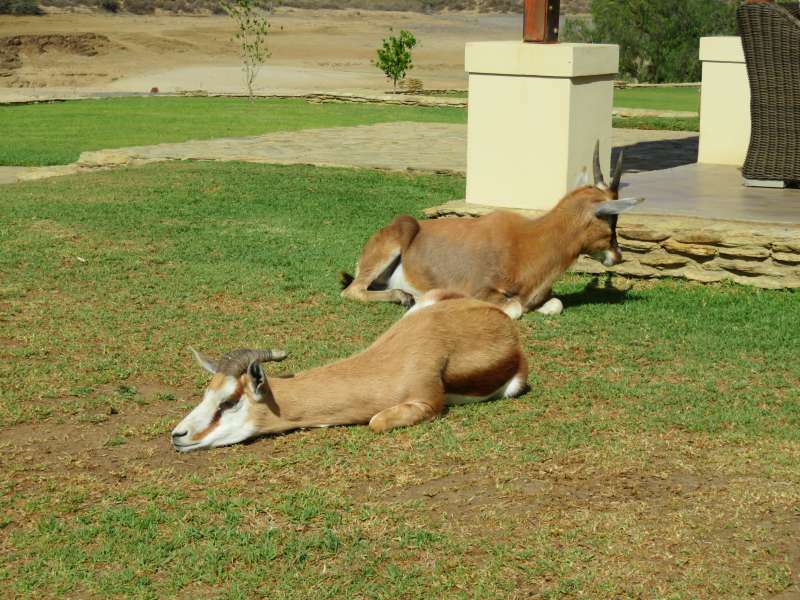 Not to be outdone there are three resident springbok who also hang around hoping for attention from the guests and a leopard tortoise which spend its days in the oasis of green lawns around the villas. The tame springboks had 'chilling out' down to a fine art. The family of meerkats were endlessly amusing to watch. Meals, especially dinner, are a highlight of the day. MJ, the chef, takes us night after night into gastronomic heaven. She seeks out our preferences and creates meals worthy of the best restaurants around the world. David is so besotted by the flavours he wants to return next year just for the food. Marilyn, the Maitre D, makes us feel very much at home with her warm and friendly service. Madi-Madi Game Reserve - practical matters. 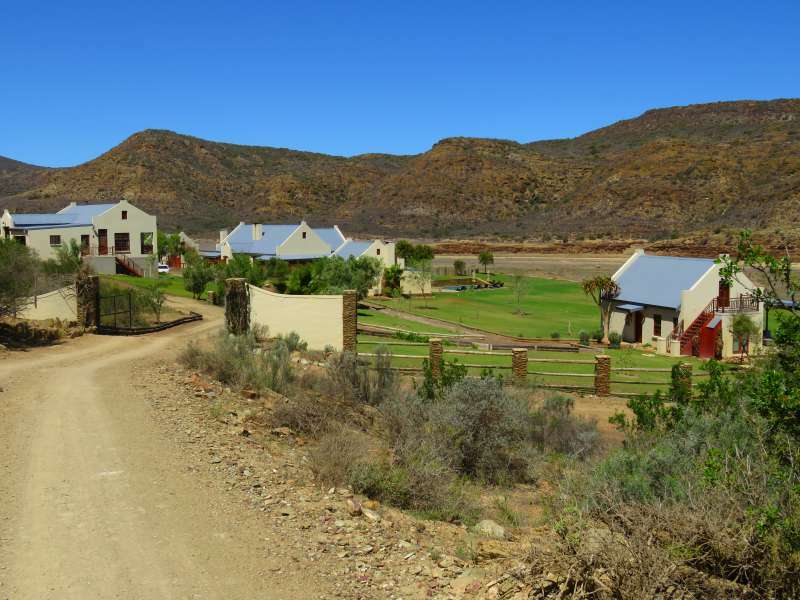 Madi-Madi Luxury Safari Lodge is a privately owned game and nature reserve in the Klein Karoo, five hours drive east of Cape Town. 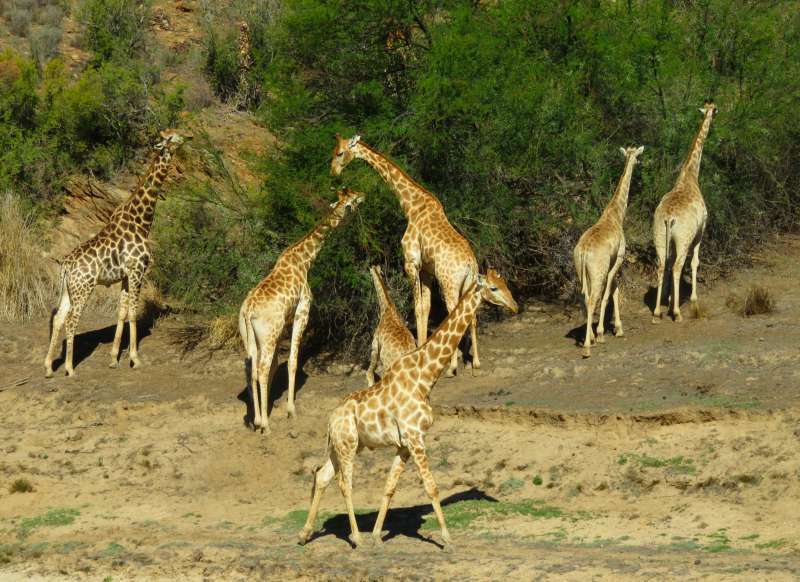 Oudtshoorn is 30 minutes away by car and George, an hour and a half. 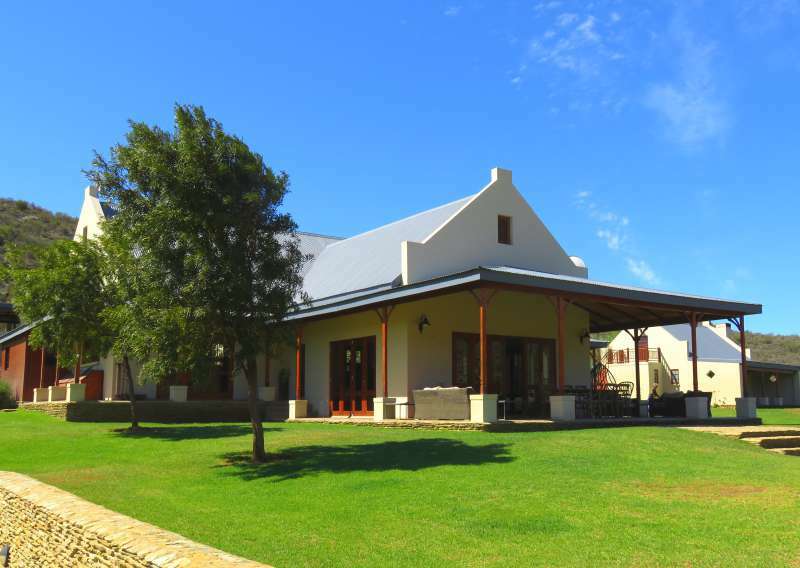 The emphasis is on quiet relaxation, luxury accommodation, friendly, welcoming service and fine food. My tip - If you are after a wind in your hair big game safari experience, Madi-Madi is not for you. The reserve is home to cape buffalo, giraffe, wildebeest, zebra, eland, springbok and other antelope, and some smaller predators but there are no elephants, big cats, rhinos or hippos. David and I came to Madi-Madi for the tranquillity but not wanting to miss out completely on South Africa's larger animals and predators we also spent a few days at a 'big-five' game reserve in the Eastern Cape. The view from the main lodge. One of Madi-Madi's strengths is its intimacy and personalised service. There are only six suites; 2 Private Executive Cottages, 2 Superior Cottages and 2 Luxury Suites. My tip - Stay in one of the Private Executive Cottages if you can. I can highly recommend where we stayed - Cottage No. 1, the first cottage on the right as you enter the main gates. It is worth booking early if you want a particular suite. Inside our Executive Riverfront Cottage. The lounge faces large opening glass doors. For up to date information on rates click - here. There are various packages available ranging from room only to full and half board packages which include meals and activities. 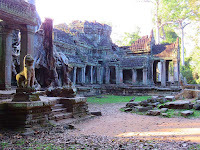 Note: David and I received a media discount toward the cost of our stay at Madi-Madi. It looks like some of those "smaller" animals enjoyed the safari lodge too. The room and facilities look very comfortable. I could see spending some time here relaxing. The room was just lovely, a great place to come and relax while watching a bit of wildlife from our terrace. These animals are so exotic ... Like you said no wonder why Springbok is the national animal .. I fell in love with springbok the first time I saw one. I loved the Klein Karoo when we visited last year! We stayed in Oudshoorn when we were there, as we had already been on Safari in Limpopo. 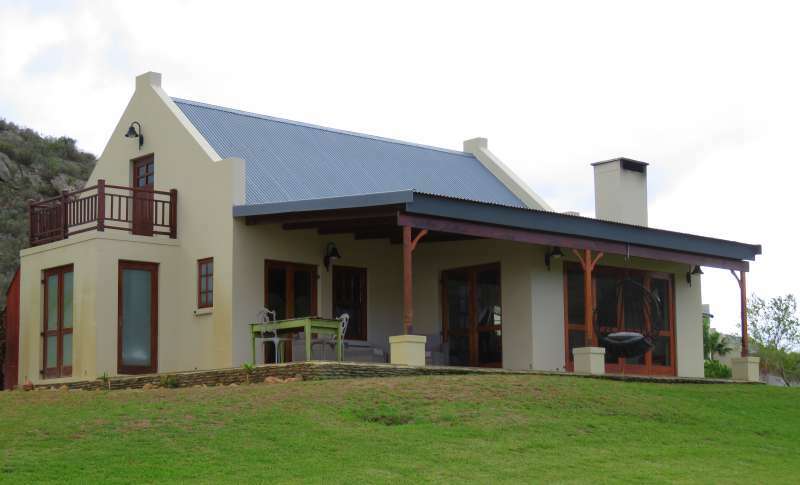 I love this lodge however and just nudged my husband to see if he's up for a visit (I just love South Africa). I just googled the Rosenhof. It looks lovely. We stayed in George in an extremely ordinary but not cheap hotel. George was fine but I wouldn't go back to the particular hotel. Next time we will stay in Oudtshoorn. 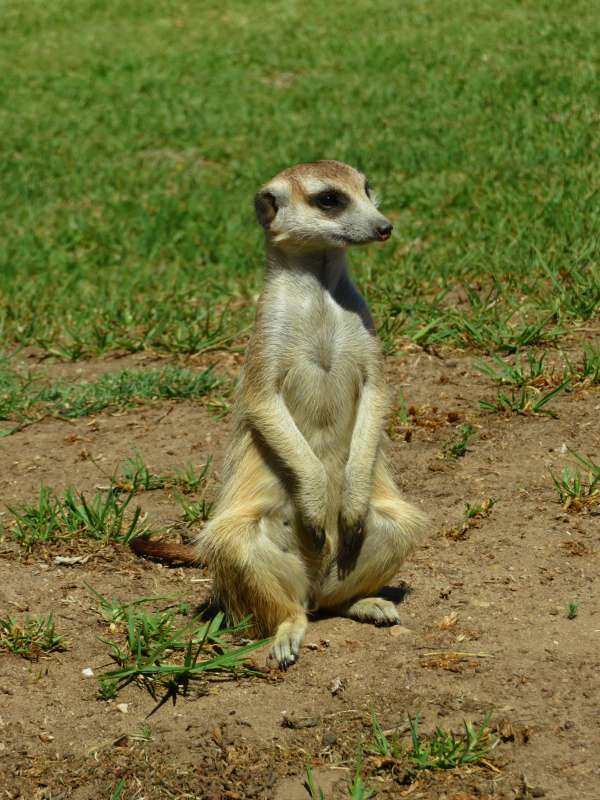 The meerkat were a real highlight of our visit. They are endlessly entertaining to watch. Haha - I have no idea whether the meerkat is male or female but there was a whole family so some of them must have been girls. I have some serious wanderlust after reading this - so many animals to see even if the timing was a bit off with the drought. Looks like a very comfortable and enjoyable place to visit. Coming from Australia, David and I are familiar with droughts and what they can do to the landscape. If you start or finish your trip at Cape Town, Madi-Madi makes a great place to spend a few days before heading east or a few days at the end of your trip. We drove from Cape Town to Port Elizabeth and back. It is an easy, safe drive. I know how devastating the effects of droughts are, Lyn. We have been experiencing them in California for the past 4-5 years. Nothing is like it used to be and the entire landscape is changing. I would imagine how much better Madi-Madi might have been if it had some rain. At least you've got to see some beautiful animals. Thanks for sharing these lodging tips. Like I told you before, my husband and I are seriously thinking to take a trip to South Africa. If we do, all these posts that you've shared on #TheWeeklyPostcard will come in very handy. If you do decide to go send me an email and I will help you with planning as much as I can. It is a wonderful country to visit. The place looks beautiful Lyn. 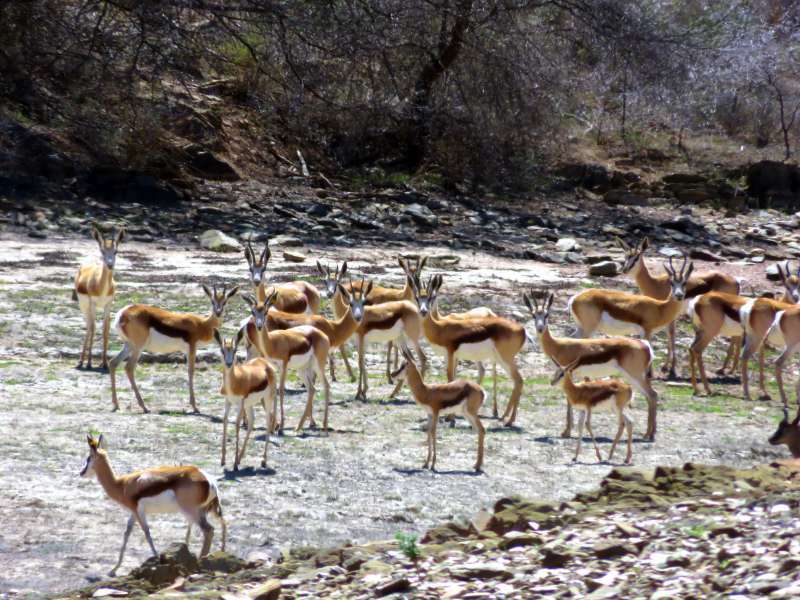 How neat to have those tame animals make their way into the area, those lovely springboks and meerkats. Awesome-ness. As for the scorpions and centipedes on the walk, sounds like the homes I inhabit in Costa Rica and Thailand. I did not see a single one during all of my trips through the tropics until 2 years ago and goodness I made up for it over the past few trips. We used to get millipedes in our house in Sydney. They came up through the skirting boards. As for scorpions, I don't think I have ever seen one in the bush even though Australia is supposed to have lots of them. This lodge looks incredible! 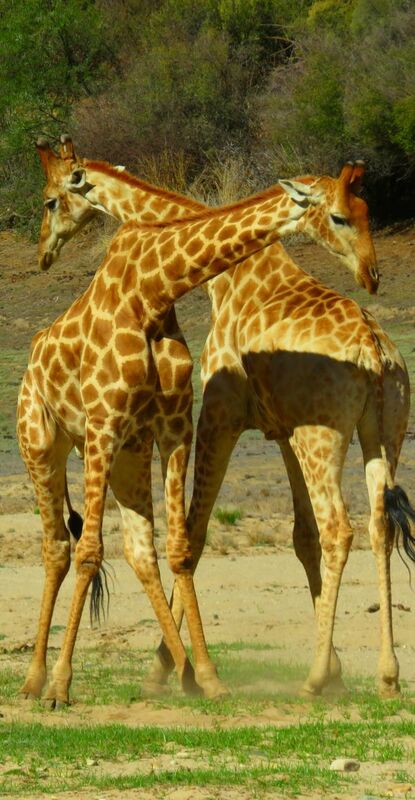 Giraffes are one of my favorites, so seems like a place I would really enjoy. David and I both loved watching the giraffes. They are so elegant. 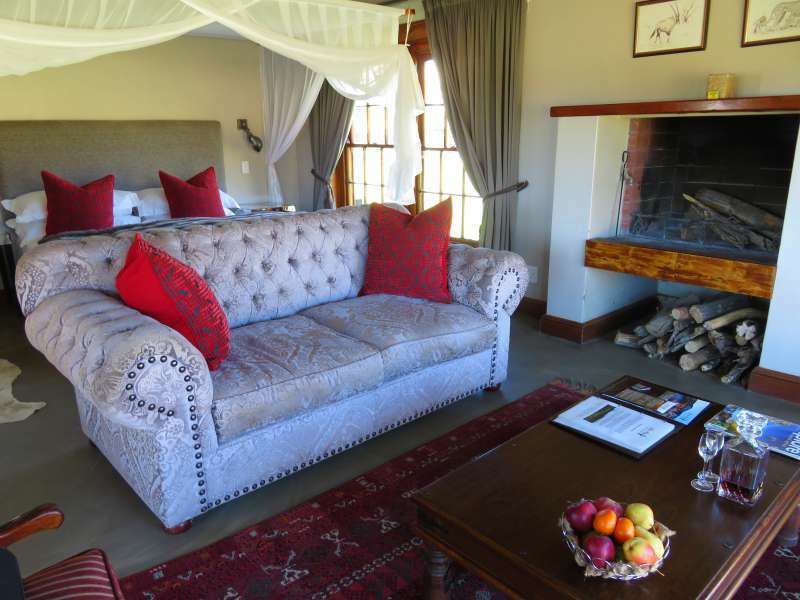 Oh gosh the Madi Madi luxury safari lodge looks divine. I so miss South Africa, and today you've reminded me of the magic and special light and scenery of the Karoo. What a lovely trip you've been having. Enjoy! On our first trip to Sth Africa we travelled along the Garden Route, but I think the Klein Karoo is more interesting. It is very easy to focus on Sth Africa's large animals and forget that there is such a diversity beneath your feet as well. Love the idea that I could enjoy the wildlife without even leaving the comfort of my lodging! I probably wouldn't even leave to explore the area. I'd just sit and take pictures and be like, "OMG look at that cute one!" Haha - my kind of holiday exactly. I had no idea about the acacia trees releasing tannins to discourage the giraffes. As if the thorns weren't enough. Anyways, Madi Madi looks like a chill place to get a different kind of Africa experience than the madness of chasing after leopard sightings with a lot of other jeeps! I am beginning to think leopards are a myth. I've seen cheetahs and lions but despite many hours spent looking for them I have never seen a leopard. One of the guides at another park (Kwandwe) told us Kruger is the place to go for leopards. That's a great post Lyn, with some beautiful photos. I would love to do an African safari some day, what a great place to take some beautiful photos and see wildlife... It'll be a nice change from those cheeky lorikeets I get every day! Haha - a bit different from the kangaroos we get in our back garden too. I would love to see all the animals - sringbok, giraffes, zebras, meeerkats. And on my first journey to Africa, I do want to see the elephants and big cats. Interesting how the trees know when to start producing tannins to ward off feeders. Madi-madi sounds like a nice place for those who go to Africa multiple times. It was a great place to relax and enjoy the landscape. If you want elephants and big cats though you need to go to one of the larger private game reserves in the Eastern Cape. 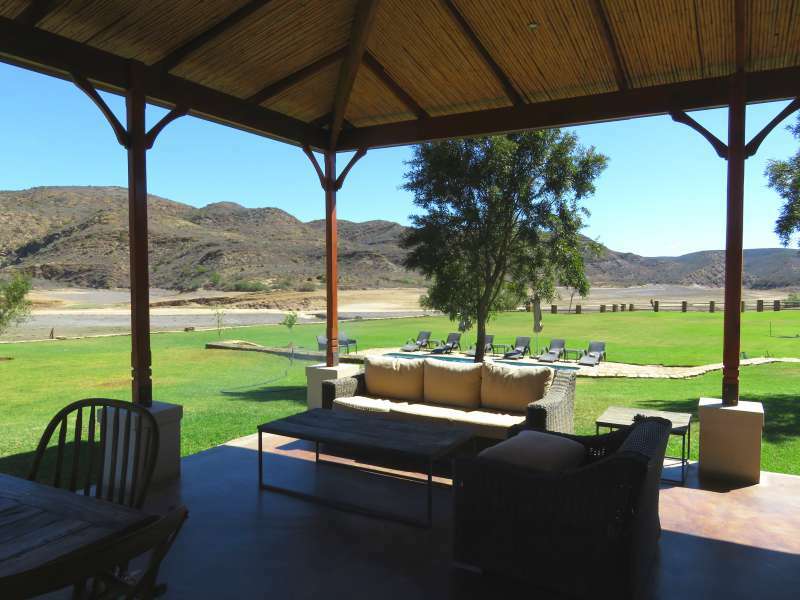 Your photos are fantastic and this game reserve looks like a perfect spot for animal watching in a relaxed setting. Africa is such an amazing place and we have so many countries in it yet to explore. The great thing about Sth Africa (the Western Cape) is that it is safe and very easy to travel in independently. I love South Africa and I can certainly see why you fell in love with Madi-Madi Karoo Safari Lodge!! What a beautiful property and the glorious animal sightings! Wonderful adventure!! We had a lovely few days. Like you we love South Africa. I am sure you will love being on safari. It was cool enough on our first night to light the fire. It was lovely.